The values of Delta Tau Delta are rooted in our founding and are as applicable today as they were more than 140 years ago. Therefore, in order to better understand what it means to be a Delt, an understanding of how your Fraternity began will be helpful. It was a bright spring morning in 1858 and, on the campus of Bethany College, all the beauties of a mountain springtime were making themselves evident, as only they can in the western mountains of then Virginia. One group of young men, however, were not particularly aware of the springtime. They were angrily discussing the happenings of the night before at the meeting of the Neotrophian Literary Society, where men who were to receive the honors of the Society had been selected. They considered what had happened to be most unfair and unjust, and they were determined to see that it should not happen again. Let’s look back to those middle years of the nineteenth century and see if we can rebuild a typical campus of that era. To begin with, all colleges were small. The total number of graduates for the whole country from all colleges and universities was less than 5000 per year. The courses of education were few, and almost entirely classics. The schools were physically small, usually consisting of one building that was home and classroom for students and faculty alike. The courses in the classics…Latin, Greek, Hebrew, many in spoken and written English, and literature, penmanship, mathematics, occasionally a rudimentary course in physics, chemistry, biology, or botany-were aimed to fill the needs of the students, most of whom were headed for ministry, law, teaching, and a few to medicine. There was also a sprinkling of students who would graduate and then return home to become pillars of society, taking over the family farm or business. In virtually all of these occupations, the ability to speak and write were prime necessities. Since all their days were spent in study or recitation, the young men who lived and studied together had little chance to practice these arts. On this scene entered the Neotrophian Literary Society. It was the first group to be formed by Bethany College students, with the consent of the faculty, so that the men would have a forum where they could practice their skills, demonstrate their abilities, and compete with one another for prizes in poetry, oratory, and prose. One or more of these societies flourished on every campus, and Bethany was no exception. The Neotrophian Society was not only the forum and the competition site, but it was also the only organization on campus which indulged in any form of social function. 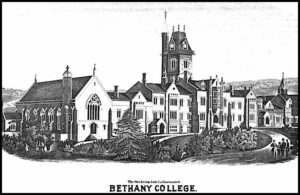 At Bethany, to control the Neotrophian Society was to control the campus life. Men were basically the same kind of creatures they are today. They had the same needs, the same goals, and they experienced success and failure. We live in a world of change, but man himself never changes-not at any measurable rate. Thus, there were campus politics then even as we know them today. On this particular night in question, the Neotrophian Society had met to decide who was to take the prize in oratory, the most coveted honor on campus. You will remember that in 1858 intercollegiate athletics had not yet been developed; the campus was all male; it was located in an isolated small town, miles from any city with access only on horseback, or in good weather, by carriage. At this meeting, when the candidates for honors were discussed, it turned out that one group of students had picked in advance the men they favored, and had joined together to swing enough votes to assure their candidates of success, regardless of the merit of their presentations. It was this situation that was being hotly discussed the next day. The group who was indignant that all candidates had not had an equal chance had several meetings after that and determined something had to be done to counteract this political alliance that had disrupted the competition and gained control of the Neotrophian. Toward the end of 1858 their plans were laid, and early in December the format of a new organization had been outlined. It was to be a secret society, known only by the Greek letters Delta Tau Delta, and its purpose was to see that the Neotrophian was returned to popular control, and delivered from the hands of the group which had seized it. These were the beginnings. Eight undergraduates, ranging in age from 17 to 26, wrote a Constitution, devised a Ritual, designed a membership badge, and established the mottos and purposes of their club. Early in 1859, the showed their muscle and accomplished their purpose. Thus our Fraternity was founded. 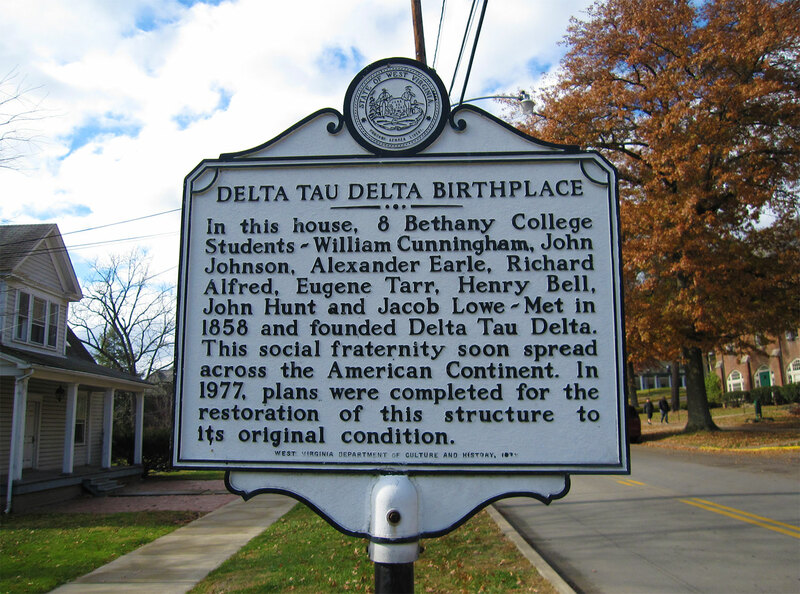 The Founding of Delta Tau Delta from Delta Tau Delta on Vimeo. Since 1858 the Fraternity has spread to nearly 125 campuses with over 125 active chapters and colonies comprised of about 7,000 undergraduate members. For over 150 years, Delta Tau Delta has in excess of 150,000 men who have become members of the Fraternity. Bethany Chapter grants charters to three chapters: West Liberty, West Virginia University; and Jefferson. To establish membership, the new chapters are given a constitutions and ritual, membership badges, and are taught the Fraternity’s mottoes and purposes, all of which had been devised by the eight founders shortly after the group’s initial formation. Whether the founders realized it at the time or not, brotherhood truly did sustain the Fraternity. Had they not had the foresight to extend welcoming arms to other young men interested in becoming Delts, the organization would have dissolved. Jefferson Chapter assumes Fraternity control and the Alpha designation. Henry Bell, a founder and alumnus, comes from his home in Kentucky to search for a way to preserve the Fraternity after the last remaining Bethany members leave for the Civil War. In Canonsburg, Pennsylvania, at Jefferson College, he finds Rhodes Sutton and Samuel Brown and persuades them to come to Bethany to be initiated. The two men brave a snowstorm and nearly impassible mountain roads on horseback to be initiated at Bethany on February 22. The first General Convention is held in Pittsburgh, Pennsylvania with five chapters represented. The early leaders of the Fraternity, by creating means of communication between the rapidly growing number of chapters, prepared the organization for growth. Ohio Wesleyan chapter assumes control of the Fraternity and takes on the Alpha designation after Jefferson chapter is reduced to a point where it can no longer function as the governing chapter. The continuity of the Fraternity was given precedence over a chapter’s pride. The remaining members of the dwindling Jefferson chapter were men of integrity, accountable to one another and to the organization, and responded to the need for a better-equipped group to manage the Fraternity. They sought out a strong chapter and handed control over. William H. Kirk was instrumental in keeping the Fraternity alive during this transition. Four divisions of the Fraternity are created, the first such step taken by any fraternity. This structural decision was made to provide better leadership to the growing number of chapters in the Fraternity. Allegheny Chapter, the fourth and final chapter to hold the Alpha designation, assumes control of the Fraternity after the Ohio Wesleyan chapter disappears. James S. Eaton, Alpha (Allegheny) 1875, a “hero” of the Fraternity, travels to Delaware, Ohio, to collect what remains of the organization’s records. After discovering what little he can about the loss of the Ohio Wesleyan members, he brings the “Alpha” designation back with him to Allegheny. There, a well-managed group of undergraduates handle their own chapter affairs as well as the supervision of the whole Fraternity. Delta Tau Delta flourishes during Allegheny’s era of control: the magazine is established; 15 chapters are founded, of which eight survive (several others are reestablished later). The Executive Council is established to govern the Fraternity, replacing government by the Alpha chapter. For the first time, administration of the Fraternity is passed from the undergraduates to alumni volunteers. The Alpha Chapter, however, makes certain the annual General Convention, to which all chapters send representatives, is still the policy-making body and that the Executive Council’s role is to carry out the decisions made at the General Convention. Our present manner of government remains remarkably similar to this early structure, so accurate were the early members in determining the Fraternity’s administrative needs. The Executive Council’s name became the Arch Chapter, and the General Convention became the Karnea, but the relationship has remained the same. Delegates control the Karnea; the Karnea determines all Fraternity policy; the Arch Chapter carries out orders given at Karnea. A new Fraternity Constitution establishes the position of chapter advisor and changes the names of the Executive Council to Arch Chapter. Members in this era acknowledged the need for active alumni involvement in the lives of undergraduate Delts. The National Interfraternity Conference is formed by a group of men’s fraternities (including Delta Tau Delta) – recognizing the need to refocus competitive energies, which previously fueled bitter rivalries, into more mature, cooperative activities; James B. Curtis, a Delt, is one of the founders. Throughout the NIC’s history, Delts have been active members. Alvan E. Duerr was the Council’s first scholarship chairman; he then went on to be president of the NIC not once, but twice. James B. Curtis, A. Bruce Bielaski, Joel W. Reynolds, and Edwin L. Heminger are all Delts who served as presidents of the Fraternity, then went on to become president of the NIC. In 2002, David L. Nagel, former president of the Fraternity, was elected to the NIC Board of Directors. Delta Tau Delta is one of only two fraternities to have had five of its members serve as president of the Conference. The NIC’s highest award, the Gold Medal, has been granted to five Delts: former Fraternity President Alvan E. Duerr; former president of Brown University, Henry M. Wriston; former Delt President and United States Supreme Court Justice, Tom C. Clark; former Delt President and founder of the Interfraternity Research and Advisory Council, Joel W. Reynolds; and former Delt President, chairman of the Delta Tau Delta Education Foundation, and newspaper publisher, Edwin L. Heminger. These great men and their achievements provide a diverse array of role models. Each man recognized the importance of becoming involved with not only the Fraternity, but with the whole Greek system. The Central Office is established in New York City. Later, the Central Office is moved to Indianapolis. Ralph M. Wray, Beta Kappa 1922, is appointed as the first field secretary. A pioneering step in the fraternity world. Today, field secretaries are called chapter consultants. Delta Tau Delta creates the office of supervisor of scholarship, becoming the first fraternity to place on its governing board an officer concerned solely with fostering high scholarship. Immediately preceding World War I, chapter scholarship declined to such a low point that a direct line could be drawn between fraternity membership and low grades. Several programs were instituted to remedy this situation, including a system of reporting on academic achievement; the Fraternity also set an academic standard for initiation. The office of supervisor of scholarship, added to the Arch Chapter, is now called the director of academic affairs. In order that a man can institute programs and hold office long enough to see them implemented, this office has no term limit. Undergraduates who realize the Fraternity is operating entirely on current receipts and has not built any major funds establish the Loyalty Fund, the Fraternity’s loan fund. This important step resulted in financial stability for the Fraternity and its chapters. From this point on, all Delts start paying into the Loyalty Fund. More than $6 million has been paid into the Loyalty Fund, enabling the Fraternity to keep undergraduate dues reasonable. Loyalty Fund monies cannot be spent, only invested. Many of these investments are mortgages on chapter houses. These investments enable the Fraternity to lend money to chapters to help them build or renovate chapter houses. Interest earned on these loans, and on other investments, is paid into the General Fund to help pay a portion of the Fraternity’s operating expenses. The Distinguished Service Chapter is formed to honor Delt alumni who render outstanding service to the Fraternity. Also, “The Delt Creed,” written by Stewart Maclean, Sewanee 1897, is officially adopted. The first edition of the Chapter Management Guide (now called the Chapter Leadership Guide) and the Good Delt: His Book, the Fraternity’s first pledge manual, are published. Centennial Development Fund established to assist new chapters that had limited funds, no alumni, and faced great difficulty in obtaining adequate housing. This fund was originally supported by alumni gifts, but undergraduates, sharing the spirit of brotherhood, voted to have part of their dues go toward the fund as well. After more than 40 years, the Centennial Development Fund continues to fulfill its purpose; a number of chapters today are in houses that would not exist were it not for this fund. Delta Tau Delta celebrates its first 100 years at the Centennial Karnea in Pittsburgh. Delta Tau Delta honored by The Newcomen Society in North America, the first fraternity so recognized, for outstanding business practices. The Fraternity’s commitment to excellence is recognized even by those outside the Greek world. 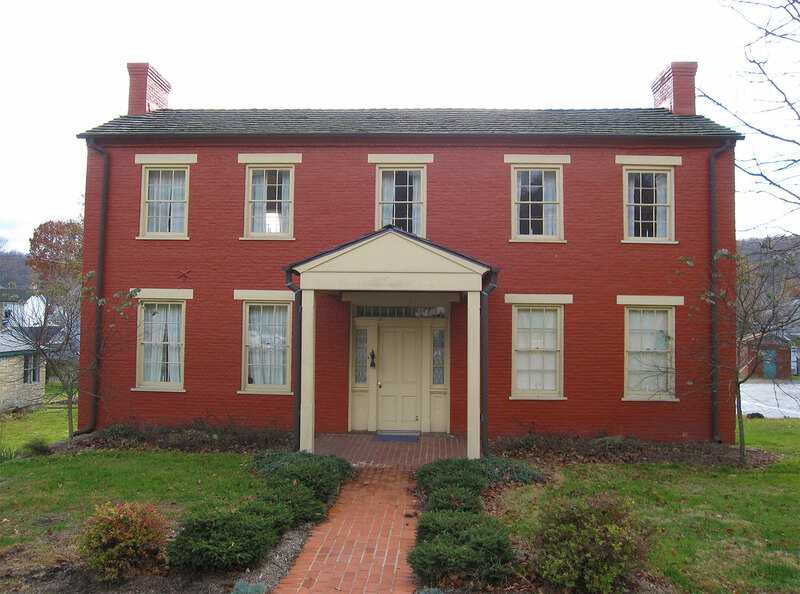 The Fraternity restores the Bethany Founding House, birthplace of Delta Tau Delta. The restoration project, first a dream of Delts at Bethany, was started at the 1970 Karnea in Toronto when Theta Chapter delegates proposed the project. An initial gift of $1000 on the floor of the convention by a young Theta Chapter Delt, Barry Gardner, matched immediately by a gift from former President G. Herbert McCracken, Pittsburgh ’21, prompted an Arch Chapter study of possibilities. This story demonstrates how brotherhood sustains us: a group of Delts had a common goal; they presented their idea to other brothers who responded with enthusiasm. The 75th Karnea, meeting in Pittsburgh, makes a pilgrimage to Bethany for the formal dedication of the Founders’ House. Both the refurbished Founders’ House and the pilgrimage serve as shining examples of Delta Tau Delta’s strong foundation in its values, its pride in the past, and its confidence in the future. The Educational Foundation of Delta Tau Delta established as a non- profit organization to promote the educational and charitable activities of the Fraternity. Today, with assistance from the Educational Foundation, Delta Tau Delta is able to offer its members several opportunities to enhance their educational and leadership knowledge. Delta Tau Delta launches a comprehensive program for alcohol abuse prevention called, “Delts Talking About Alcohol.” Another step toward excellence, the program represents the Fraternity taking an active role in helping future members prevent problems throughout their lives. The Fraternity adopts the Chapter Responsibility Guidelines to assist chapters with liability and risk management issues. The Fraternity begins the Delt Insurance and Risk Management Program to give chapters uniform quality and advice on insurance coverage and risk management. The first Delt Leadership Academy is conducted in Chicago, Illinois. The Delta Tau Delta Educational Foundation announces the completion of a $6 million capital campaign. The Chapter Leadership Guide is developed, replacing the Chapter Management Guide. Delta Tau Delta Housing Association is established. Delta Tau Delta desires to examine means to increase its focus on our founding principles with all of its members and constituencies. Under the leadership of International President Jeff Heatherington, the Mission and Values Statement was adopted by the Arch Chapter and Undergraduate Council of Delta Tau Delta Fraternity on January 7, 1995. This vision has proven useful in communicating to non- members what Delta Tau Delta represents, thus defining our organization for those unfamiliar with the Fraternity’s Ritual and Delt Creed. Also in 1995, the Member Responsibility Guidelines are adopted by the Arch Chapter and Undergraduate Council to replace the former Chapter Responsibility Guidelines. David B. Hughes, Ohio Wesleyan, 1957, is elected International President of the Fraternity. David becomes the first third-generation fraternity man to become international president for his fraternity. David follows his grandfather, Edwin Holt Hughes, Ohio Wesleyan, 1889, and his father, Francis Montgomery Hughes, Ohio Wesleyan, 1931, in this position. The John Fisher Certification Conferences are conducted in Chicago and Atlanta, training more than 300 alumni volunteers in the presentation of a values-based chapter planning and leadership retreat for the undergraduate chapters. The Leadership Academy is increased to three academies, thanks to continued alumni donations to the Educational Foundation. Also, the second biennial John Fisher Conference is conducted in Indianapolis with 200 volunteers reaffirming their devotion to Delta Tau Delta’s undergraduates. At the Minneapolis Karnea, the Educational Foundation announced the completion of the Building on Excellence campaign. The $9.5 million raised was in excess of early goals. This money has been set aside to endow the leadership programming of the Fraternity. In May 2002, Delta Tau Delta moved into the new permanent headquarters for the Fraternity in Fishers, Indiana. This structure now houses the archives of the Fraternity in a permanent museum, a dedicated leadership conference center, a call center to benefit fundraising efforts, and all offices of the Central Office and Educational Foundation staff. The first Presidents Leadership Retreat is held in Indianapolis. This inaugural event brought together chapter presidents and their advisors from 20 chapters throughout the Fraternity for a weekend of lessons in values-based leadership and decision-making.